With the pedigree of a miniLDV™ and the miniaturization know-how that MSE is known for, the microPro was designed specifically to fill a gap in boundary layer profilometry. 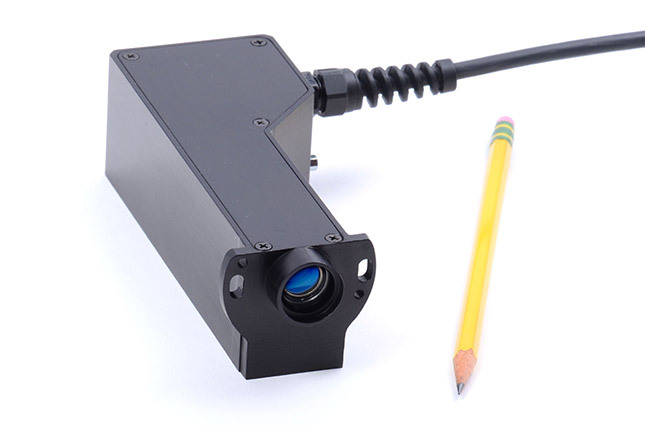 The microPro probe contains a laser, miniature beam shaping optics, receiving optics, detection system, and an electronic traverse. The distance between the sensor and the probe volume (standoff distance) is up to 0.6 inches (15 mm)*. The size of the probe volume (measurement domain) is only 15 by 30 by 80 μm (x by y by z). In a laser doppler velocimeter, two coherent laser beams are crossed (forming the probe volume) to generate interference fringes. When a particle or microscopically textured surface move through this region, it reflects bursts of light corresponding to its passage through the regions of constructive interference. Since the spacing between the fringes is constant, the velocity of the particle or surface is proportional to the frequency of the reflected bursts. With the integral electronic traverse, the probe volume can be moved through the thickness of the boundary layer, providing a direct measurement of its velocity profile. In addition, the software can perform a fit of the profile and, given the viscosity, calculate the shear stress at the wall. The microPro System consists of the microProbe probe, Processing Engine, electronic traverse controller, and the 1D Burst Processor Acquisition Manager software package. Optionally available is a computer with the software installed and verified by MSE technicians. 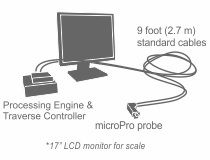 The microPro probe is protected under U.S. Patent No. 6,654,102.